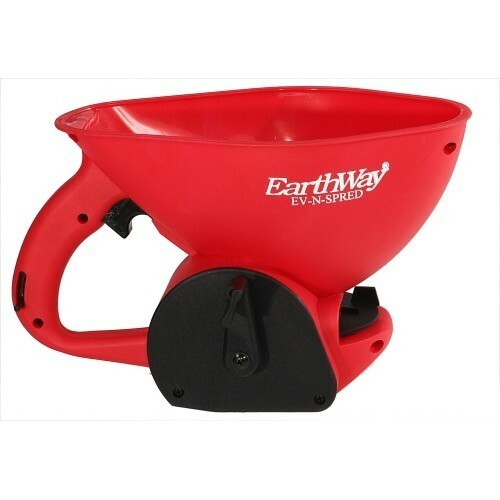 The Earthway Ev-n-Spred 3400 is an ergonomic hand spreader for use with ice melt and most other dry granular materials. The spreader is designed for smaller hands with an integrated scoop design, the 3400 can scoop material out of bags and boxes, keeping hands clean whilst in use. Simple and effective way to evenly distribute ice melt. Not suitable for use with rock salt. Can also be effectively used to distribute fertilizers and seed. Before filling the hopper with ice melt, ensure the variable flow is set at closed. This will ensure no product is lost during the filling stage. Click the trigger to engage to flow of ice melt and continue until the whole of the desired area is covered.